Smart Media web design and Intelligent WebCentre CMS proved to be the right choices that led to a national healthcare marketing award for Oncology Systems Limited (OSL). A commercial organisation providing products to the NHS and private hospital sectors in the UK and Ireland, OSL is recognised as a leader in the supply of radiotherapy solutions and is well known within the healthcare industry. "The website is now an important part of our business development, and provides good quality business enquiries. 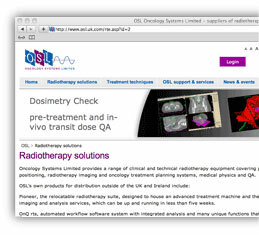 The interest from abroad for our radiotherapy imaging software is something we simply would not have without the new website"
Julie Mead, Director of OSL. The company posed many questions to Smart Media regarding flexibility, ongoing development for future functionality requirements and importantly, accessibility of the website for its core customer base of NHS based specifiers and buyers. It also had to clearly understand the tangible benefits it could expect from a hosted, maintained system that incurred an annual fee compared to a free open source CMS. In a recent survey, the OSL website design and ease of use were rated good or excellent by 95% of respondents.